The funny thing is, I'd never heard of trick dog titles before a month ago. I mean, I knew you could train your dog to do tricks, but not that they were titles the AKC would recognize. But as it turns out there is a woman named Kyra Sundance (love her name!) who trains Weimaraners to perform tricks using just positive reinforcement, which I am now a huge fan of. 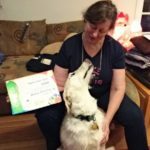 She's put out several nicely thorough books on training your dog to do tricks — her system is called Do More With Your Dog — and set up a certification system to encourage folks to (effectively) do more with their dogs… and the AKC decided to recognize it, and have a program of their own as well. What she does is have you perform a certain number of tricks for each title, and then have someone accredited witness it, and that's how you get your titles. The AKC recognizes the DMWYD accreditations, and it cost about $20 for title regardless of which group you go with, so I'm going to support the woman-owned business. Once Goldie is an Expert Trick Dog I will send in the request for her to be recognized as such by the AKC. Pretty cool! So Goldie & I have started doing some more focused trick dog training with an eye towards getting her some "alphabet soup" after her name. Luckily some of the agility elements (e.g. : the teeter or the weave poles) are considered "tricks." Thus we blew through her Novice, Intermediate, and even Advanced Trick Dog titles pretty quickly — so she's now my Golden Girl NTD, ITD, & ATD! I'm very proud of my beautiful, clever girl right now! 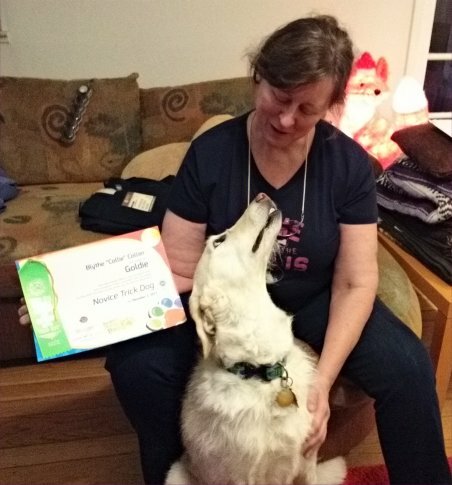 The Novice and Intermediate certificates have arrived in the mail already, and I've included both pictures of her titles below, as well as the official videos of several of the tricks she did. Her Advanced certificate is on its way — doubtless slowed down by holiday traffic — but once it arrives I'll post that one too. Here's the first batch of tricks by Goldie for her Novice Trick Dog title! They include, in order, a come that got slightly cut off by the video taking a while to start, then a sit up pretty, down, sit, stay, paws up on her mark, nose touch to hand, high-five, shake hands, bow, crawling low to the ground, figure 8 through my legs, and a "leave it" for food! That was 13 of the 15 tricks needed for the title — though I later redid the come and sit up pretty so they could be more easily seen. Two more very short videos show the tricks Goldie did that I think look the cutest: the "Have you been naughty?" trick, where you unfortunately can't really hear me, but can certainly see Goldie's (unrepentant) enthusiasm for hiding her face! — and the "Say your prayers!" trick. Amusingly enough, as it turned out I taught Goldie the trick incorrectly — she's supposed to lower her nose down between and below her forelegs — but I still think it's awful cute! I'll have more videos tomorrow for the later-earned titles!